This Is Your Official Reminder To Come Karting With Us This Sunday In New York! 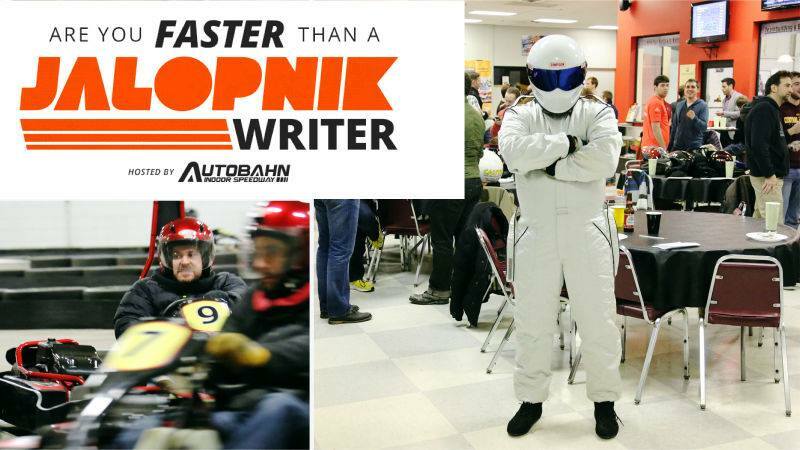 Wondering if you’re faster than a Jalopnik writer? (You probably are.) But remember, you can come find out in person at our next Are You Faster Than A Jalopnik Writer? karting event (RSVP here) at Autobahn Indoor Speedway on Sunday, October 23rd. It’s for a great cause! As a reminder, we’ll be at the Autobahn Indoor Speedway at the Palisades Mall this Sunday, starting at 5 p.m. EST. By then you’ll have witnessed the glory of the U.S. Grand Prix mere hours earlier. Come to the karting track with speed in your blood and the hot desire to win pumping through your veins. Plus, there will be racing, food, fun, freebies and prizes courtesy of Blipshift. And best of all, we’re doing this in support of the RPM Foundation, which helps train the next generation of restorers and fabricators. Click that link to vote on the project we’ll help fund. The tickets are only $55; the chance to show us how good you are is priceless. Come check it out. What: A go-kart race in super fast carts with your favorite writers and fans! When: October 23rd from 5 p.m. to 9 p.m.
How: RSVP here, a ticket is $55. Why: Because it’ll be fun and support a good cause.